Endemic to parts of River Congo basin in the Democratic Republic of Congo. Like other Nannocharax, this species probably inhabits swiftly-flowing sections of rivers and streams. Here the fish are found sheltering amidst the rocky substrates or among marginal vegetation. Fully grown at only 1.8″ (4.5cm). You could keep a few of these in a tank as small as 18″ x 12″ x 12″ (45cm x 30cm x 30cm) – 40 litres. This species does well in heavily-planted aquaria in which the growth of aquatic plants provides plenty of shaded areas. Some pieces of driftwood or smooth pebbles could be added to provide additional interest and shelter for the fish. It will also thrive in a tank set up to resemble its natural habitat of fast-flowing streams and rivers. Use coarse gravel as substrate, adding some smooth, water-worn rocks and driftwood twigs/branches to create the desired effect. Placing the filter or spraybar at one end of the tank will provide the desired flow, and locating these in such a way that the flow of water breaks the surface is useful in supplying additional oxygen. Most aquatic plants will fail to thrive in such conditions, but the African native genera Bolbitis and Anubias are tough and usually survive. Hailing from such environments where the water is constantly being refreshed means that the species is particularly sensitive to accumulation of organic wastes. Small, frequent water changes of 10-20% tank volume are therefore a must in order to maintain high water quality. Feeds primarily on benthic invertebrates in nature, and unsurprisingly shows a predilection for small live and frozen foods such as bloodworm or Daphnia in the aquarium. These type of foods can be fed almost exclusively, as most specimens will not accept dried alternatives. This species does well in a community of other peaceful species that enjoy similar conditions. 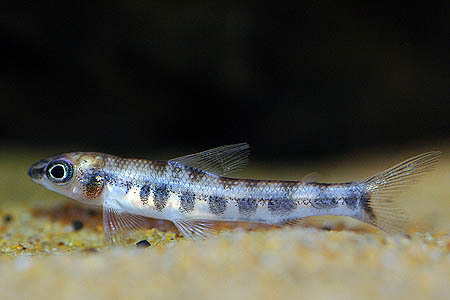 In an African-themed stream tank suitable tankmates include Alestiid characins such as Alestopetersius caudalis or Ladigesia roloffi, African Garra species, smaller Mochokid catfish and reophilic cichlids such as Steatocranus. It will also do well alongside similarly-sized danionins, hill stream loaches, many South American characins and smaller Loricariids. Although vaguely territorial, you can keep a group of these in a tank with planty of hiding places. The interaction between individuals is particularly fun to watch. Seemingly not yet achieved in the hobby. There are currently 25 described species in the genus Nannocharax, these forming a monophyletic group with members of the very similar Hemigrammocharax. None can be described as particularly common in the hobby but N. brevis and N. fasciatus are the most often seen. They are notoriously tricky to identify though, and it’s quite possible that more than two species are being sold under these names. In nature these fish occupy a similar ecological niche to the South American darter characins of the genus Characidium. The similarities do not end there, as members of the two genera look superficially very similar to one another. Apparently the only definite way to establish the correct genus without slicing up your fish is to examine the scales. These are typically rougher (ctenoid) in Nannocharax than Characidium. Characidium species also tend to be thicker across the caudal peduncle, but given the state that many of these are in when they arrive in dealers’ tanks this should be considered a tentative means of identification at best. These issues aside, Nannocharax make fascinating and quirky aquarium inhabitants. They are very inquisitive, always on the move and their characteristic swimming style of “hovering” and “hopping” around the tank is rather endearing. They certainly make up for in personality what they lack in gaudy colours.